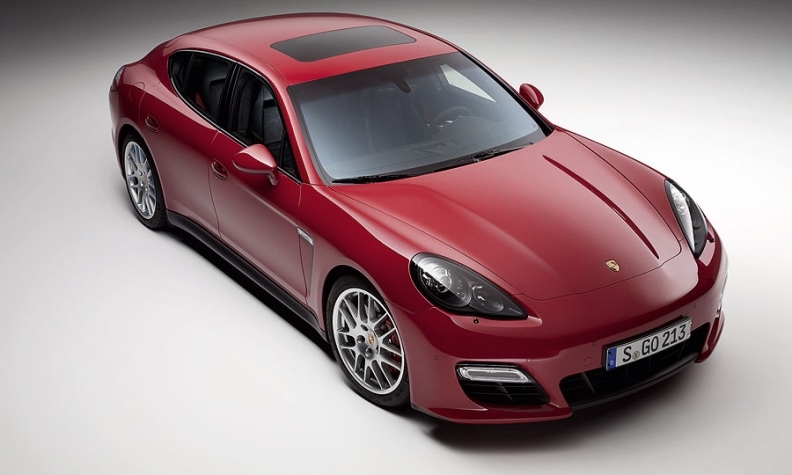 The Panamera GTS is based on the 4S model and comes with a 4.8-liter naturally aspirated V8 engine. LOS ANGELES -- Porsche is adding to its lineup of GTS models with a version of the 2013 Panamera sedan, the company said today. It was introduced at the Los Angeles auto show by Porsche factory drivers Patrick Long and Romain Dumas. The Panamera GTS is based on the 4S model and comes with a 4.8-liter naturally aspirated V8 delivering 430 hp at 6,700 rpm. That's an increase of 30 hp over the 4S model. Torque also grows to 384 lb-ft., up from 369 lb-ft. in the 4S. The redline is extended to 7,100 rpm. The Sport Chrono package comes standard on the GTS along with Porsche's seven-speed PDK transmission with paddle shifters on the steering wheel. The GTS weighs 176 pounds less than the 4S though the use of hybrid steel-and-aluminum construction of the body. The sprint from 0 to 60 mph takes just 4.3 seconds, which is only four-tenths slower than the new 911. Top speed of the four-door is a track-tested 178 mph. The Panamera GTS has an adaptive air suspension and Porsche Active Suspension Management, which constantly adapts to the road and the style of the driver. The ride height is lowered by 10 millimeters. When the sport button is pushed, the exhaust sound of the GTS is baffled toward the passenger compartment using what Porsche calls a "sound symposer." This is accomplished with the addition of an acoustic channel that transmits intake vibrations as engine sound into the A-pillar. We haven't heard it from the inside yet but if the exterior sound is any indication, it should be just what Porsche drivers are looking for. Two optional interior equipment packages are offered. They feature a black interior with either Carrera Red or GT silver accents, along with corresponding GTS badges on the headrests and the seatbelts.